What is Pro-Port? These specialty heads are purpose-engineered castings designed for the professional cylinder head porter and engine builder. Features include extra-thick decks, under-sized intake and exhaust runners, and increased wall thickness to allow for custom CNC porting. 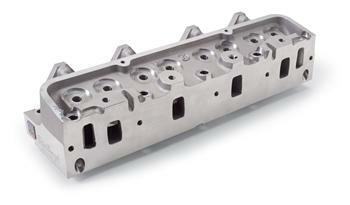 The castings are semi-machined with finished accessory, intake and exhaust flange bosses. Pro-Port heads are available for small-block Chevy (15°, 18° & 23°), big-block Chevy (conventional and spread-port), LS-series Chevy, small-block Ford (including SC-1), FE Ford, and Pontiac. Optional HIP Processed castings available! This aerospace process results in an incredibly strong, super dense aluminum casting that has three times the fatigue life and nearly the consistency of billet aluminum.